The Ohio River, which streams westward from Pittsburgh, Pennsylvania, to Cairo, Illinois, is the largest tributary, by volume, of the Mississippi River in the United States. At the confluence, the Ohio is even bigger than the Mississippi (Ohio at Cairo: 281,500 cu ft/s (7,960 m3/s); Mississippi at Thebes: 208,200 cu ft/s (5,897 m3/s)) and, thus, is hydrologically the main stream of the whole river system, including the Allegheny River further upstream. The 981-mile (1,579 km) river flows through or along the border of six states, and its drainage basin includes parts of 14 states. Through its largest tributary, the Tennessee River, the basin includes many of the states of the southeastern U.S. It is the source of drinking water for three million people. It is named in Iroquoian or Seneca: Ohi:yó, lit. "Good River" or Shawnee: Pelewathiipi and Spelewathiipi. The river had great significance in the history of the Native Americans, as numerous civilizations formed along its valley. For thousands of years, Native Americans used the river as a major transportation and trading route. Its waters connected communities. In the five centuries before European conquest, the Mississippian culture built numerous regional chiefdoms and major earthwork mounds in the Ohio Valley, such as Angel Mounds near Evansville, Indiana, as well as in the Mississippi Valley and the Southeast. The Osage, Omaha, Ponca and Kaw lived in the Ohio Valley, but under pressure from the Iroquois to the northeast, migrated west of the Mississippi River to Missouri, Arkansas and Oklahoma in the 1600s. In 1669, René-Robert Cavelier, Sieur de La Salle led a French expedition to the Ohio River, becoming the first Europeans to see it. After European-American settlement, the river served as a border between present-day Kentucky and Indian Territories. It was a primary transportation route for pioneers during the westward expansion of the early U.S. In his Notes on the State of Virginia published in 1781–82, Thomas Jefferson stated: "The Ohio is the most beautiful river on earth. Its current gentle, waters clear, and bosom smooth and unbroken by rocks and rapids, a single instance only excepted." The Ohio River is a climatic transition area, as its water runs along the periphery of the humid subtropical and humid continental climate areas. It is inhabited by fauna and flora of both climates. In winter, it regularly freezes over at Pittsburgh but rarely further south toward Cincinnati and Louisville. At Paducah, Kentucky, in the south, near the Ohio's confluence with the Mississippi, it is ice-free year-round. Paducah was founded there because it is the northernmost ice-free reach of the Ohio. The Ohio River is formed by the confluence of the Allegheny and Monongahela rivers at Point State Park in Pittsburgh, Pennsylvania. From there, it flows northwest through Allegheny and Beaver counties, before making an abrupt turn to the south-southwest at the West Virginia–Ohio–Pennsylvania triple-state line (near East Liverpool, Ohio; Chester, West Virginia; and Midland, Pennsylvania). From there, it forms the border between West Virginia and Ohio, upstream of Wheeling, West Virginia. The river then follows a roughly southwest and then west-northwest course until Cincinnati, before bending to a west-southwest course for most of its length. The course forms the northern borders of West Virginia and Kentucky; and the southern borders of Ohio, Indiana and Illinois, until it joins the Mississippi River near the city of Cairo, Illinois. 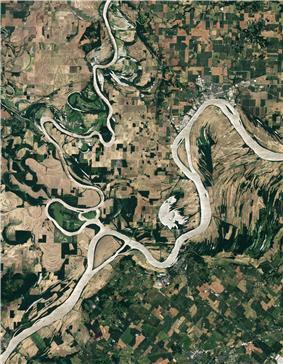 The resulting floodwaters enlarged the small Marietta valley to a size more typical of a large river. The new large river subsequently drained glacial lakes and melting glaciers at the end of the Ice Age. The valley grew during and following the ice age. 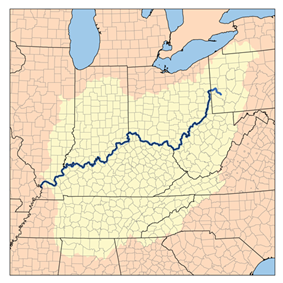 Many small rivers were altered or abandoned after the upper Ohio River formed. Valleys of some abandoned rivers can still be seen on satellite and aerial images of the hills of Ohio and West Virginia between Marietta, Ohio, and Huntington, West Virginia. As testimony to the major changes that occurred, such valleys are found on hilltops. French fur traders operated in the area, and France built forts along the Allegheny River. In 1669, René-Robert Cavelier, Sieur de La Salle, led an expedition of French traders who became the first Europeans to see the river. He traveled from Canada and entered the headwaters of the Ohio, traveling as far as the Falls of Ohio at present-day Louisville before turning back. He returned to explore the river again in other expeditions. An Italian cartographer traveling with him created the first map of the Ohio River. La Salle claimed the Ohio Valley for France. In 1749, Great Britain established the Ohio Company to settle and trade in the area. Exploration of the territory and trade with the Indians in the region near the Forks by British colonials from Pennsylvania and Virginia - both of which claimed the territory - led to conflict with the French. In 1763, following the Seven Years' War, France ceded the area to Britain. The 1768 Treaty of Fort Stanwix opened Kentucky to colonial settlement and established the Ohio River as a southern boundary for American Indian territory. In 1774, the Quebec Act restored the land east of the Mississippi River and north of the Ohio River to Quebec, appeasing the Canadien British subjects, but angering the Thirteen Colonies. Lord Dunmore's War south of the Ohio river also contributed in giving the land north to Quebec to stop further encroachment of the British colonials on Native land. During the American Revolution, in 1776 the British military engineer John Montrésor created a map of the river showing the strategic location of Fort Pitt, including specific navigational information about the Ohio River's rapids and tributaries in that area. However during the Treaty of Paris (1783), the entire Ohio Valley was given to the United States. The economic connection of the Ohio Country to the East was significantly increased in 1818 when the National Road being built westward from Cumberland, Maryland reached Wheeling, Virginia (now West Virginia) providing an easier overland connection from the Potomac River to the Ohio River. Louisville was founded at the only major natural navigational barrier on the river, the Falls of the Ohio. The Falls were a series of rapids where the river dropped 26 feet (7.9 m) in a stretch of about 2 miles (3.2 km). In this area, the river flowed over hard, fossil-rich beds of limestone. The first locks on the river – the Louisville and Portland Canal – were built to circumnavigate the falls between 1825 and 1830. Fears that Louisville's transshipment industry would collapse proved ill-founded: the increasing size of steamships and barges on the river meant that the outdated locks could only service the smallest vessels until well after the Civil War. The U.S. Army Corps of Engineers improvements were expanded again in the 1960s, forming the present-day McAlpine Locks and Dam. Cave-in-rock, view on the Ohio (circa 1832): aquatint by Karl Bodmer from the book "Maximilian, Prince of Wied's Travels in the Interior of North America, during the years 1832–1834"
The Ohio River as a whole is ranked as the most polluted river in the US based on 2009 and 2010 data although the more industrial and regional Ohio tributary, Monongahela River, ranked behind 16 other American rivers for pollution at number 17. The Ohio River is a naturally shallow river that was artificially deepened by a series of dams. The natural depth of the river varied from about 3 to 20 feet (0.91 to 6.10 m). The dams raise the water level and have turned the river largely into a series of reservoirs, eliminating shallow stretches and allowing for commercial navigation. From its origin to Cincinnati, the average depth is approximately 15 feet (5 m). The maximum depth is below the McAlpine Locks and Dam at the Falls of the Ohio at Louisville, Kentucky, where flood stage is reached when the water reaches 23 feet (7 m) on the lower gauge. From Louisville, the river loses depth very gradually until its confluence with the Mississippi at Cairo, Illinois, where it has an approximate depth of 19 feet (6 m). ^ Leeden, Frits van der; Fred L. Troise; David Keith Todd (1990). The Water Encyclopedia (2nd ed.). Chelsea, Mich.: Lewis Publishers. p. 126. ^ ohioriverfdn.org: "Ohio River Facts"
^ Bright, William (2004). Native American Placenames of the United States. ^ "Shawnees Webpage". Shawnee's Reservation. 1997. Retrieved 26 April 2013. ^ Jefferson, Thomas, 1743–1826. Notes on the State of Virginia; the single instance refers to the former rapids near Louisville. ^ *Taylor, Alan (2006). The Divided Ground: Indians, Settlers, and the Northern Borderland of the American Revolution. New York: Alfred A. Knopf. p. 44, see map on 39. ^ Montrésor, John (1776). "Map of the Ohio River from Fort Pitt". ^ "Bird's Eye View of Cumberland, Maryland 1906". 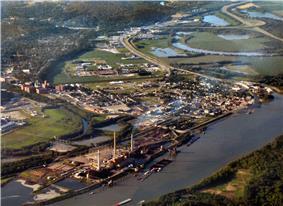 ^ "Report: Ohio River most polluted in U.S.". Dunn, J. P. (December 1912). 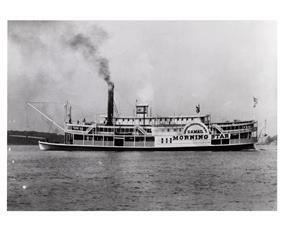 "Names of the Ohio River". The Indiana Quarterly Magazine of History 8 (4): 166–70.